I know what you may be thinking right off the start. T-what? Tlayuda. 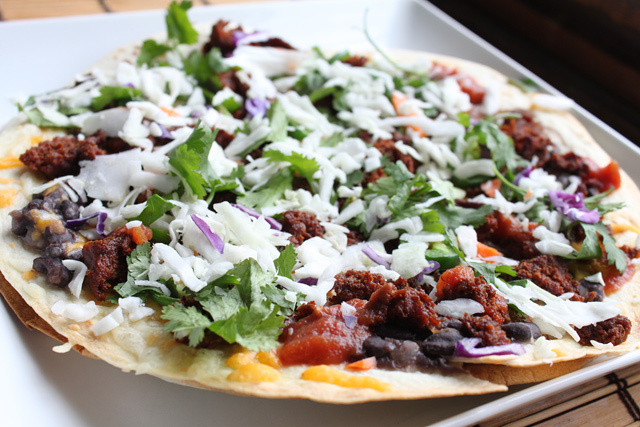 It’s essentially Mexican street food, in particular of the pizza descent. Think of great Mexican ingredients loaded onto a cooked, large flour tortilla. This is typically street food, and good Lord is it ever good, and fun to eat. This is a popular snack food, but let me tell you, it can be turned into a meal depending on the ingredients you put onto it. Typically a single tortilla, I was super hungry and decided I would go full force and make this a ‘double tlayuda’. Think of it as an open faced pizzadilla. 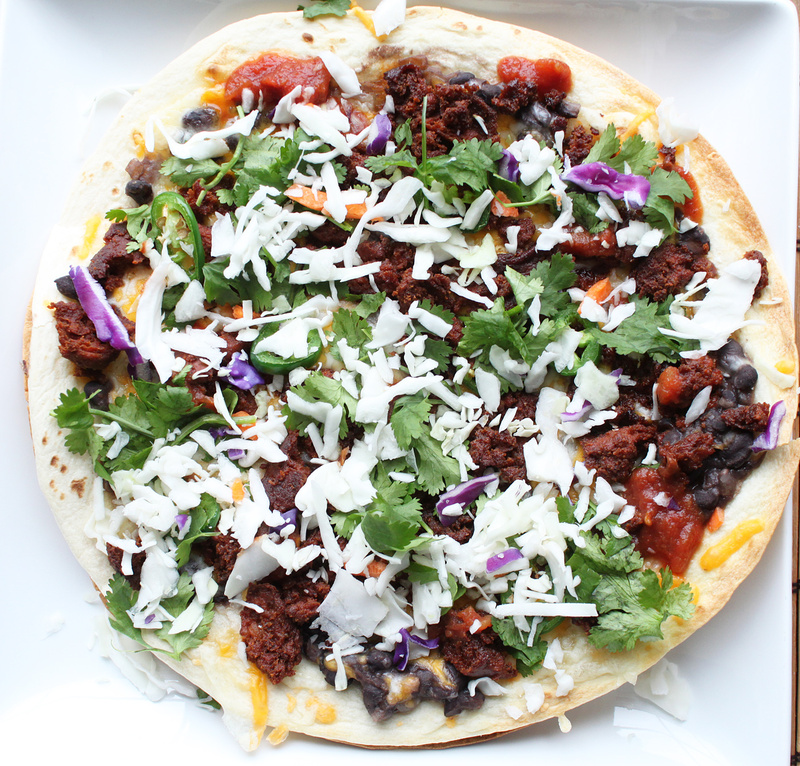 You can make these with all sorts of your favorite proteins, but I wanted chorizo, a classic Mexcican ingredient, and in particular on the tlayuda. The classic uses some drizzle of lard, but I’m not into that as I am getting enough from smashed black beans cooked in some oil, garlic, and onions. ned, then add in the garlic. After about a minute, toss in the black beans and water. Cook for about 15 minutes on medium to medium-low heat. Once the beans have softened a bit, use a fork, or potato masher, and start to mash the beans. I do not go for a few refried blend on these as I like some texture from the beans. Go about 50/50 on that mash. OK, next step. Preheat your oven to 350 degrees. 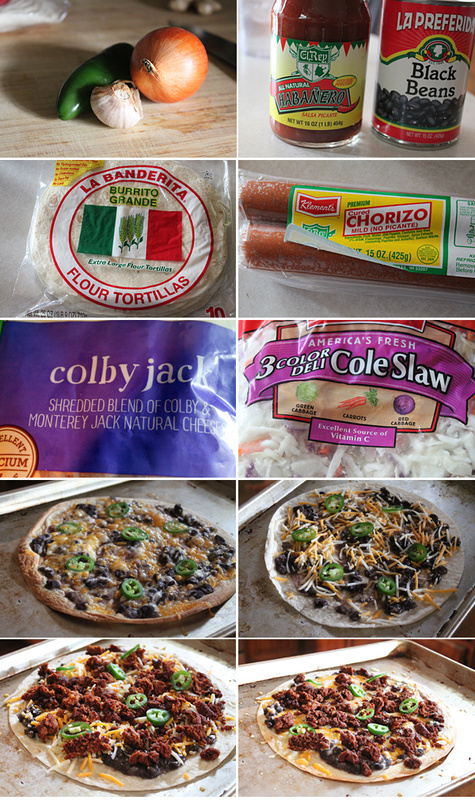 Take a flour tortilla, smear some black beans on it, some cheese, and some jalapenos to your liking, (again I used two on this one as a stack), and place it on a sheet pan and place in the preheated oven. Cook for about 2 minutes, just to cook it slightly to lightly brown. Once the cheese is slightly melted, remove from the oven. Stack another tortilla on top. Gently press. Add enough bean mash to lightly coat the the entire top tortilla, then a generous amount of cheese to cover the top, then more jalapenos (if ou desire). Spread the cooked chorizo all over the top tortilla, along with a generous amount of cheese, and place back into the oven. Cook until the cheese is nice and melted, the tortilla nicely browned, and then remove. Once you remove, shower with some of the raw coleslaw, fresh cilantro, and drizzle your favorite salsa or hot sauce. Now you can fold this, or you can slice into wedges. I’m a wedge man. Wedges are good. Holy Moly. If you think about this all together, well you are going to drool. When you eat it, it makes you want to be alone and devour the whole thing so no one is looking. It’s so good, and something that should probably come off the street and onto Mexican restaurant menus. Spice, cheese, crisp, soft, veg. What’s not to love. Make it (stacked or not), and I’m sure you will love it. Enjoy! Going to try making this over the weekend. Crossing my fingers it comes out good. Thanks for the recipe! My mouth watered when I saw this and I knew I had to make it for Jerry and I. It was fabulous! We have a new favorite! Thanks for a great recipe! Thanks Paula! Glad you and Jerry enjoyed it, I know my family did, plus it make a bunch. Hope all is well, and Merry Christmas to you the two of you! Merry Christmas! All is well and Jerry is already ordering seeds and such for next season. We are very busy catching up with friends and family and of course staying warm! Hope all of you are doing well also!